The following review, is a detailed summary and analysis about the SWINCA Project. This will be helpful for everyone who wants to learn more and get an objective view about the SWINCA Project. SWINCA aims to disrupt the Crypto Real-Estate industry by lowering the barrier and become a multi-properties owner of worldwide high-yields properties within minutes. The SWINCA project seeks to modernize the real estate industry by combining this business with modern technology, such as blockchains and cryptocurrency, and allows users and investors to become owners of several high-income real estate objects. Swinca’s mission is to make the real estate market accessible to both large and small investors by developing new tools for interaction, which are ready to offer us with pleasure. The Swinca platform is easy to use, instant and does not require a minimal investment to automatically receive rental income and appropriate capital gains. The aim of this project is to give anyone who wants access to every opportunity to invest in real estate throughout the world. They can transparently choose what percentage of the apartment, house, office or land they want to invest. In this way, they can benefit from a flexible personal real estate portfolio to manage. The platform has all the necessary licenses and financial insurance of possible losses, as well as the ability to manage various exchange processes between cryptocurrency and Fiat. SWINCA allows you to get the maximum return on your investment by reducing all secondary costs and the absence of intermediaries. With Swinca, there is a competent strategy and simplicity of information will allow you to choose the desired vector of development. 10% commission on rent income and capital gains:The company Swinca (Swiss Invest Capital SA) Is generating revenue the same way users/investors generate their own revenus through the platform. Swinca take a 10% profit on investors profits. property and lock it until he decides to sell them back. At that moment the SWI price is expected to increase in value. Membership to Priority Investment Pass (for non ICO participants): In order to access to the greatest deal on the platform (I.e High return potential) investors must subscribe to the PIP membership. Subscription for professionals: Professionals pay to sell or rent their property, swinca act as a broker. Others: Rental activities, leisure services (Holiday and resort), other assets, cleaning services etc. The Swinca team comprises of topnotch professionals in their domains. They have ambitious goals which will enable them to set new standards for the Market. To achieve this goal a strong Team is built with all the necessary skills, talents and long-time experience needed for the project. 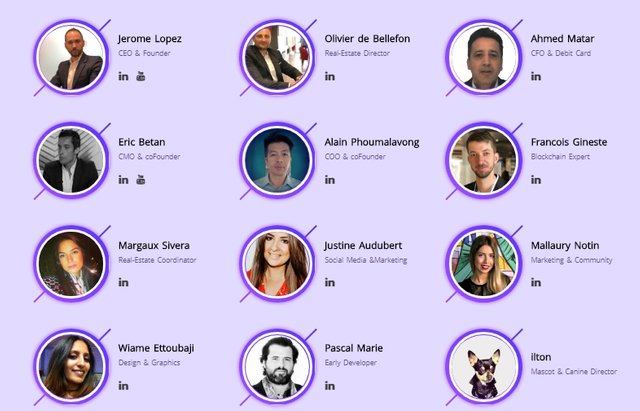 Most of the team members on Swinca have verified LinkedIn profiles. This is all good because the more transparency a company have in regard to their team, the more trustworthy they typically are. The goal of the project is to let anyone access to any real estate investment opportunity worldwide. They can transparently choose what percentages of a flat, a house, an office or a land they want to invest in. That way they can benefit from a personalized real estate portfolio that is flexible to manage. Real-estate investment is considered as attractive, safe and generating important returns. However it is still complicated, has limitation and entry barriers. Thus, owning properties is not as accessible as it could and should be, remaining slow and inefficient. The SWINCA project seeks to modernize the real estate industry by combining this business with modern technology, such as blockchains and cryptocurrency, and allows users and investors to become owners of several high-income real estate objects. NOTE: This article is just a guide to potential clients, stakeholders and everybody itching for a snip of this wonderful project. I am not a project team member or its representative but a supporter of this incredible project. The whitepaper will provide an in-depth and thorough analysis of this wonderful project. You can click on the link below and find out more about this wonderful project.